“Constructing a three-story, 187,500-sq-ft building designed for instructional flexibility in a highly constrained urban location required an agile construction team. Laydown space, already at a premium due to the proximity of several adjacent structures and busy city streets, had to be closely coordinated with the concurrent renovation of a historic home, one of several buildings that share the law school site. With as little as 5 ft separating new construction from some of Columbia’s oldest buildings, Gilbane took the initiative to incorporate additional subsurface safeguards into the foundation design via an earth retention system supported by auger piles. This installation approach eliminated the risk of potentially damaging vibrations from pile-driving operations. Appropriately for a structure dedicated to the pursuit of justice, Gilbane more than doubled the university’s specified participation goals for minority- and woman-owned businesses. Forty-two percent of the project team was composed of M/WBE firms, of which more than 28% were owned by African-Americans. By incorporating subcontractor information into the project’s BIM system, the project team was able to identify and resolve more than 250 clashes before construction began, yielding major time and cost savings. 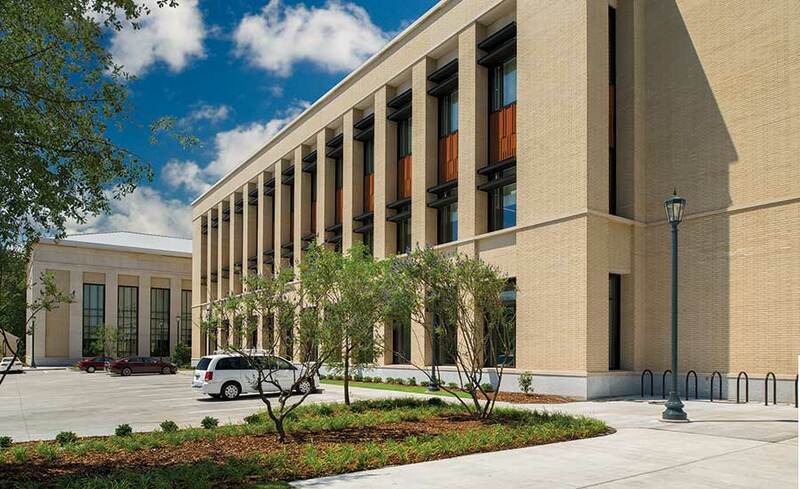 Despite its size, the new School of Law’s limestone and brick exterior complements its history-rich environment, including nearby legal buildings such as South Carolina’s State House and Supreme Court.